In 1542, a few short years after the reconquest, and at a time when the market districts of Ronda were forming, the citizens of Ronda requested a new bridge that would directly connect La Ciudad with the highest point across the gorge, an area that was long and flat, and ideal for the expansion of Ronda which was already becoming crowded. It wasn’t until Ronda’s golden years of the 1700s that permission was finally granted to span the rio Guadalevin with a new bridge that would be able to carry more traffic and be a more direct route between El Mercadillo and La Ciudad than the older and more circuitous road through Padre Jesus. In 1734 the first attempt to span the gorge at this height was completed by the architects Jose Garcia and Juan Camacho using a single arch design. Their bridge was hastily built and insufficiently strong enough to withstand the stresses of carrying traffic, and in 1741 the entire bridge collapsed taking 50 souls to their deaths in the gorge below. The current bridge stands 98m from base to top and was built from 1759 to 1793, a total of 34 years, and spans 66m from side to side. The original design was drawn by Domingo Lois de Monteagudo, an architect of great renown, and it is believed the bottom third of the bridge was built under his direction although by 1778 he was no longer involved with the project. 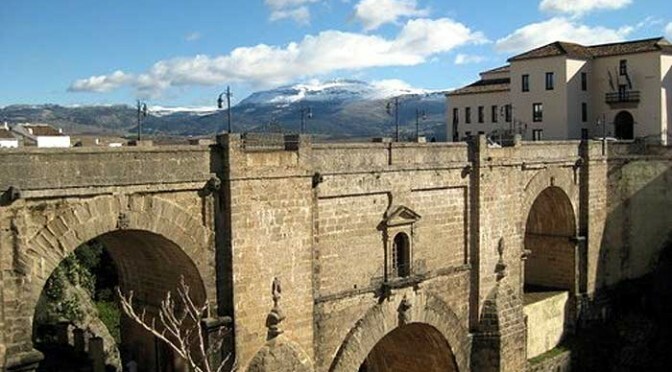 By 1785 work on the bridge had stalled and the administrator of Ronda, Pascual Ruiz, called on the expertise of one of Andalucia’s top architects, José Martin de Aldehuela to complete the bridge. His remarkable design built on Lois de Monteagudo’s foundation, turning the bridge into a work of art which has since become Spain’s most photographed bridge, and one of her most photographed icons. Rumour suggests Martin de Aldehuela committed suicide from this very bridge, although in fact he lived a long and happy life dying many years later in Malaga in 1802. The rumour came about after suggestions in his day that a second, and perhaps more beautiful bridge, would be needed, and that he jumped from the bridge in despair. Despite being an architect of great renown in Malaga, the Puente Nuevo in Ronda even in those days was considered Martin de Aldehuela’s crowning career achievement. Fortunately the rumour was just that, and to date a second bridge hasn’t been needed, so it is safe to say the architect’s legacy is assured. The job of actually constructing the bridge from the architect’s plans fell to a Rondeño, Antonio Diáz Machuca who invented to system of pulleys and other heavy lifting equipment that hoisted the large stones from the gorge floor where they had been quarried and shaped, up to where they were needed on the bridge. Constructed in three stages, the first stage forms the foundation against the bedrock and the first arch, which in turn forms the foundation for the main arch that takes the bridge to a height of 90m. The final stage includes the two top arches and the centre room of about 60 square metres that today contains the interpretation museum of the bridge, although it’s most famous use was as prison for bandits and dangerous criminals during the 19th century, and then for political prisoners during the Spanish civil war. A gruesome rumor persists to this day that civil war era prisoners were thrown to their deaths from the bridge, and written about by Ernest Hemingway in the novel For Whom The Bell Tolls, it’s a great story embellished by a great writer, maybe it’s true, maybe not, I’ll let you decide! The standing joke in Ronda for anyone who has to go to work when they’d rather stay at the bar with their mates is the shout ‘Tajo!’, a reminder of Moorish times when Christian slaves and prisoners would spend their lives chained to the steps that lead to the river; their job under pain of a good thrashing was to pass empty buckets down and full buckets up so that Ronda’s water tower was always full.